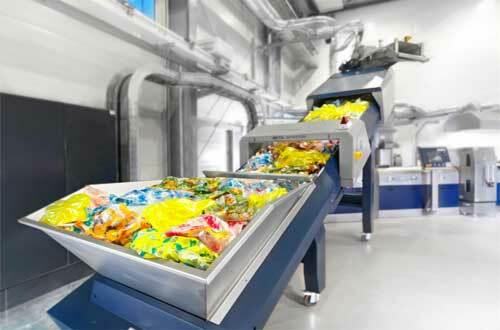 Austrian plastics recycling systems manufacturer, EREMA, is to showcase its technology for recycling heavily printed LDPE materials with live demonstrations at the upcoming Chinaplas 2016 exhibition in Shanghai. The company said that it will be demonstrating its INTAREMA® 1007 TVEplus® with an EREMA SW4/104 RTF melt filter at the show, which takes place from 25 to 28. The system will be in action producing clean pellets from 300-350 kg/h of heavily printed LDPE materials. The pellets will then be reprocessed directly at the booth to make film. According to the manufacturer the high demand for its TVEplus technology is explained by the special challenges faced in recycling processes for heavily printed materials. It explained that binding agents and other additives that are constantly found in the inks are a problem as they melt at the processing temperatures of the plastic matrix and break down in parts. EREMA said that its technology offers efficient filtration, homogenisation and degassing at the highest level. This is claimed to result in high-quality recyclates which can be used in the production of film. According to the company it has undergone significant international expansion. In addition to EREMA China and EREMA North America, “OOO EREMA” was founded in Moscow at the beginning of 2016. Furthermore, the company said that in spring this year its EREMA North America subsidiary will more than double the size of its trial centre in the US in response to the high demand.